One of the hottest silhouettes of 2018 gets a colour refresh. Don’t be sleepin’ on the latest colourways of the Nike React Element 55 – landing this week at JD! The React revolution began at the start of 2018, when Nike dropped the Epic React. With a sleek design, this sneaker stood out. It’s equipped with Nike’s innovative React cushioning, which takes comfort and responsiveness to the next level. 11% softer and 13% bouncier than Lunarlon foam, React cushioning was truly changing the game! 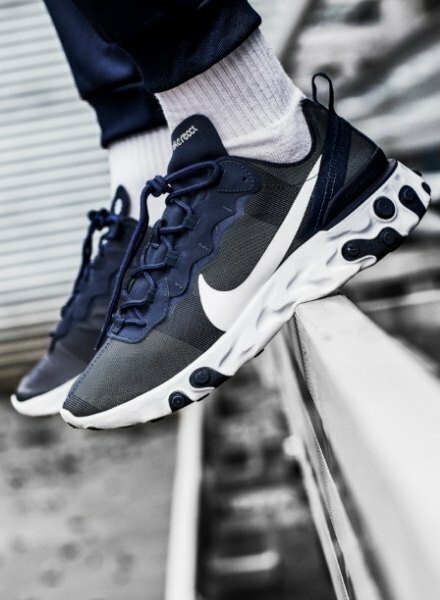 As summer rolled around, Nike pushed themselves further by crafting a silhouette with a statement style to match the React’s performance – the React Element 87. Adding a futuristic edge to the runners, they brought a deconstructed style with a semi-translucent upper, accents to the midsole and a switched-up lacing system. The result was a sneaker that’s ready for the streets or the track. Becoming one of the toughest creps to cop, the React Element 87 sent the sneaker world into meltdown. Wanting to let every sneakerhead rep the creps, Nike created the React Element 55. With the same silhouette and style as the 87, including design lines that nod to the Internationalist, these heritage-packed trainers switch out the translucent upper for a synthetic one – givin’ you a bold look you can cop and rock all year round! Propelling Nike’s history into the future, this cutting-edge design guarantees to turn heads. 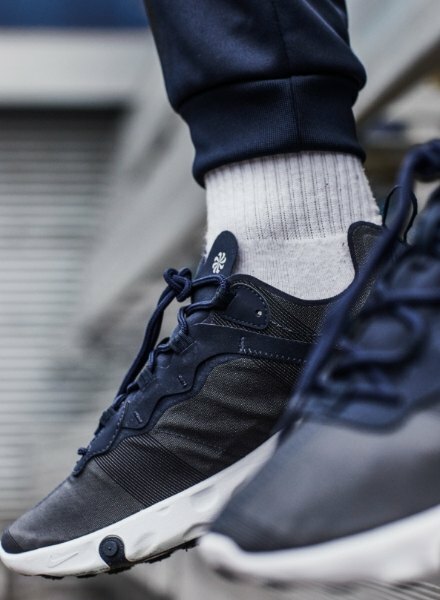 With exaggerated stitching and taping to the upper for a deconstructed vibe, these Element React 55 has a textile upper and Nike React foam underfoot. Finished with rubber outsole pods and the legendary Swoosh to the sidewalls. With the React Element 55 in high demand, Nike is givin’ you even more options with two fresh colourways droppin’ this week. Make sure to check out the black colourway with subtle dark grey accents, or rep some *JD-exclusive* style with the navy and white. Landing at JD on 17.01.19 @ 8am.